The purpose of this study was to characterize patient and clinician perceptions of programmable medication devices (dispensers and timers) being marketed to consumers to improve medication adherence. Using principles of usability testing, 33 volunteer staff and clinic patients rated seven devices. 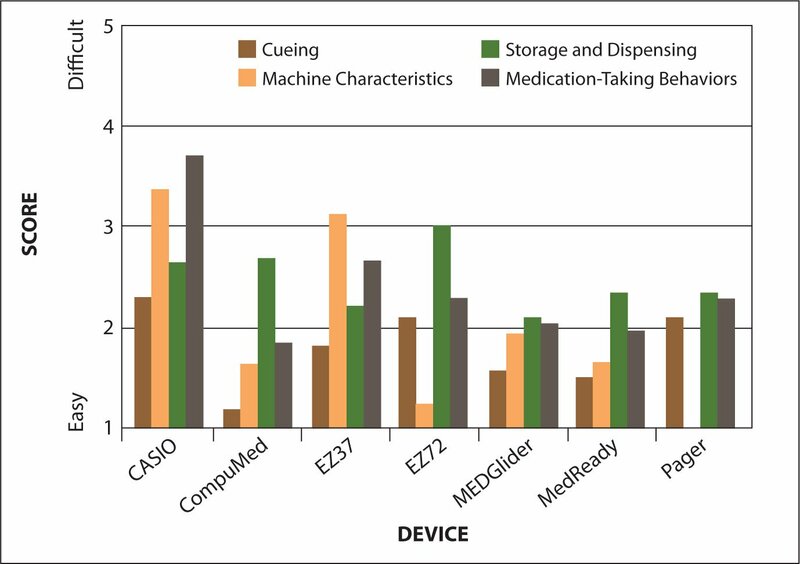 Raters scored devices on cueing and alarms, storage and dispensing, machine characteristics, potential to improve adherence, and cost. 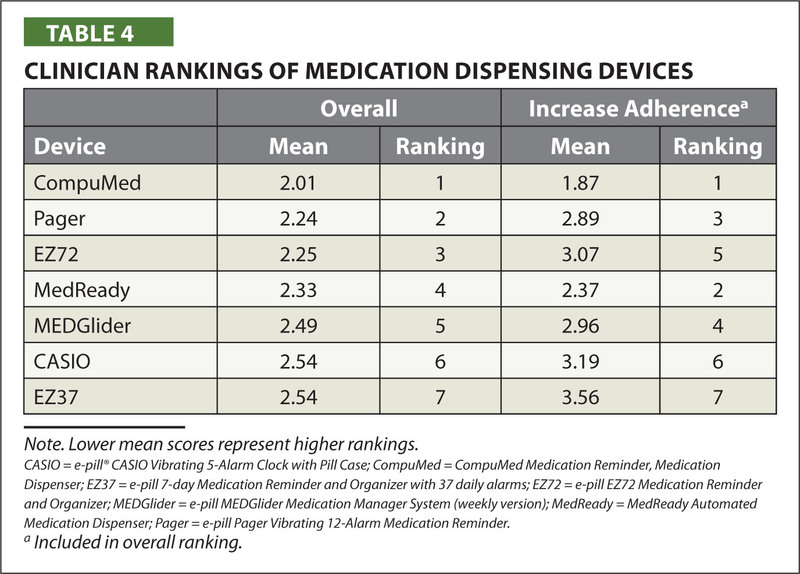 Medication dispensers ranked highest overall. However, even if the Department of Veterans Affairs paid for them, patient participants would be unlikely to use them. No significant differences were found across the devices in the perceived likelihood that the device would improve medication adherence. In this article, we provide a set of criteria for patients who might choose such a device and clinicians who may recommend these kinds of devices. More work is needed in the design and deployment of these devices if they are to be part of a successful medication adherence plan. Dr. Wakefield is Director, Health Services Research Program, Harry S. Truman Memorial Veterans Hospital, and Research Associate Professor, University of Missouri-Columbia, Sinclair School of Nursing, Columbia, Missouri; Ms. Orris is a medical student, A.T. Still University, Kirksville, Missouri; Mr. Holman is Research Associate, Center for Implementation of Innovative Strategies in Practice, Iowa City Veterans Affairs Medical Center, Iowa City, Iowa; and Dr. Russell is Associate Professor, University of Missouri-Columbia, Sinclair School of Nursing, Columbia, Missouri. This research was supported by the Department of Veterans Affairs (VA) Health Services Research and Development (HSR&D) Service grant NRI 99-345 and a VA HSR&D Advanced Research Career Development award to Dr. Wakefield. The contents are solely the responsibility of the authors and do not necessarily represent the official views of the Department of Veterans Affairs. Address correspondence to Bonnie J. Wakefield, PhD, RN, Director, Health Services Research Program, Harry S. Truman Memorial Veterans Hospital, 800 Hospital Drive, Columbia, MO 65201; e-mail: bonnie.wakefield@va.gov. Medication nonadherence is a prevalent problem, and an extensive body of research has attempted to address this issue (Russell, Conn, & Jantarakupt, 2006). People age 65 and older consume 33% of all prescription medications (Avorn, 1995) and are more likely to use multiple medications (Kaufman, Kelly, Rosenberg, Anderson, & Mitchell, 2002). Since publication of the Institute of Medicine (2000) report To Err Is Human: Building a Safer Health System, increasing effort has been directed toward understanding and preventing adverse drug events, especially in hospital settings. More recently, attention has turned to outpatient settings. An estimated one third of emergency department visits are due to an unintentional overdose of medication, and the estimated annual rate of adverse drug events treated in the emergency department for individuals older than age 65 is more than twice the rate of those younger than 65 (Budnitz et al., 2006). Thus, evaluating strategies to improve safe medication use is critical. Medication dispensing and reminder devices, developed to help patients manage their medications, range from simple pillboxes to complex electronic machines that dispense medications at the appropriate times, give instructions to the patient, and contact a care-giver if any problems are detected (Buckwalter, Wakefield, Hanna, & Lehmann, 2004). Randomized controlled trials on medication adherence in older adults have reported mixed results for the usefulness of cues and organizer interventions, with slightly more than half of studies reporting significantly improved adherence in treatment groups (Russell et al., 2006). When medication devices are evaluated empirically, they are frequently combined with cognitive and behavioral interventions to improve medication adherence, which makes distinguishing the individual impact of the device especially difficult (Russell et al., 2006). For example, in a randomized control trial of 172 older adults using a 1-day pharmacist intervention involving medication reminder packaging and education, self-reported adherence showed no significant difference between the treatment and control groups (Hanlon et al., 1996). Other studies evaluated the effectiveness of different kinds of medication devices on adherence. In a randomized controlled trial of 61 older adults with chronic illness, an automated dispensing device with an audible medication-taking prompt was superior in enhancing medication adherence compared with pre-filled pillboxes alone after a 6-month period (Winland-Brown & Valiante, 2000). A third randomized controlled trial evaluating organizers alone found no significant difference in adherence between treatment and control groups (Crome, Akehurst, & Keet, 1980). The purpose of this study was to characterize patient and clinician perceptions of in-home programmable medication reminder devices. Increasingly marketed to consumers to improve medication adherence, these devices have not been evaluated for usability. This study assessed the functionality of seven programmable medication dispensers and timers and examined patients’ and clinicians’ perceptions of each device. Behavioral strategies are designed to reinforce or change specific behavior patterns. These are the most widely used kind of medication adherence interventions and include approaches such as packaging, dosage modifications, and mail and telephone reminders (Roter et al., 1998). The pillbox (plastic container with separate compartments) is one of the earliest behavioral interventions and is still used today. Although pillboxes have the advantage of being low cost, opening the lid can be difficult for patients with arthritis and other manual dexterity problems. In addition, although pillboxes address organization and storage, they do not alert the individual when it is time to take medications. Blister packs filled by a pharmacist can serve as a reminder for patients, but they have several disadvantages, including inability to add or remove medications after the blister pack has been created (Park, Morrell, Frieske, Blackburn, & Birch-more, 1991); pharmacist labor cost to create the packs; and tamper-proof packaging requiring manual strength and significant dexterity to open (Salzman, 1995). Like pillbox organizers, blister packs offer a visual reminder whether the medication has been taken but do not alert the individual when it is time to take the medication. Voice message reminders have been tested for improving adherence. Patients are telephoned, and an automated voice recording reminds them of the type and amount of medication to take (Hughes, 2004). Disadvantages of this approach include the need for a working telephone line, the need to be at home to receive the reminder calls, and potential cost of the system. More recently, efforts have focused on development of new technologies to facilitate medication adherence. Medication adherence aids can now help organize, remind, and dispense medication with a machine. These adherence aids fall into two categories: medication dispensers and pillbox timers. Medication dispensers are sophisticated, computer-based monitoring systems that can be programmed to perform a variety of functions. They can be used to separate medications into compartments, emit audible or visual alarms, and dispense the medication. Some products include an automated voice to instruct the individual on how to take the medication properly (e.g., with water or food). Some dispensers are capable of contacting a care-giver by telephone if a medication dosage was not taken within a predefined period (Buckwalter et al., 2004). They can also lock away the medication so the individual cannot accidentally overdose. The price of these dispensers can be up to $1,000, and the caregiver notification services can cost an additional $10 to $50 per month. Whereas medication dispensers “release” medications at a predetermined time, pillbox timers are opened by the individual in response to an alarm. These devices are smaller, more portable machines typically used by individuals who take only a few medications per day or who occasionally forget to take medication. Timers are less expensive than dispensers, costing $20 to $100. These devices are usually filled by the individuals themselves. An alarm can be attached to the organizer or may be separate from it. The alarm can be programmed to vibrate, beep, or flash a light at the predetermined time. These alarms can also be used to remind individuals of non-oral medications. Patients have different requirements for taking medications. Therefore, no device can satisfy all requirements for everyone. Devices come in various sizes, with different features, functions, and audible frequencies. It can be difficult to determine which device will fit a patient’s needs. Although important features include the device’s weight, ease of opening, portability, durability, cost, and child-proof safety, three key features are storage capacity, cueing, and dispensing. Storage Capacity. The storage capacity of machines currently on the market ranges from 15 to 60 aspirin-sized pills per slot. Machines must have enough slots for the number of daily dosages required by the patient. A third storage criterion is how frequently the patient must refill the machine. Machines allowing for a longer time before refilling are a bit larger in size. Cueing. Cueing considerations include the number of alarms per day and whether the patient can use the alarms for other events, such as non-oral medications. Some timers can emit as many as 37 alarms per day; however, the patient must be able to recall what the alarm is for. Individuals with hearing impairment may prefer a flashing light or vibrating alarm, or an alarm with adjustable volume and pitch. Finally, the size of the display should be considered if the display is an integral part of the alarm and cueing system. Dispensing. Dispensing should not be confusing. For example, some machines dispense by opening the container on one end for the morning dosage and the other end for the afternoon dosage, and this may cause patients to become confused as to which side they need to use. For safety, some dispensers lock away unused dosages. For example, a machine may not allow the next dosage to be dispensed until the first (unused) dosage has been removed. It can indicate to the patient that a dosage has been skipped, and when the patient pulls out that dosage, the next will be immediately dispensed. However, a patient who is confused may mistakenly then take both dosages at once, instead of discarding the previous dosage as instructed by the machine. Because medication dispensing devices may be more likely to be prescribed for patients already experiencing difficulty in adhering to medication regimens (e.g., forgetfulness, mild cognitive impairment, vision difficulties), it is critical that such devices be evaluated for usefulness. Poorly designed devices lead to frustration, and users may abandon the device if it is too difficult to use. Usability is a measure of the quality of a user’s experience when interacting with a product or system (Usability.gov, n.d.). Usability reflects a combination of factors that affect the user’s experience with the product, including ease of learning, efficiency of use, ability to recall how to use the device on subsequent tries, error frequency, and satisfaction (Usability.gov, n.d.). Briefly, there are three broad approaches to measure system or product usefulness (Armstrong, Brewer, & Steinberg, 2002): usability inspections, experimental testing, and surveying. Usability inspections involve specialists scrutinizing a design according to established criteria. Experimental testing, the most rigorous form of usability testing, attempts to quantify user performance using a true experimental design, in which one or more variables of interest are manipulated within a controlled environment. The third approach, surveying, exposes users to the product then solicits their opinions on design features. Surveys may be distributed by mail or electronically. Users can be interviewed in person (e.g., when participants are already using the device at home) or observed directly—the approach used in this study. Suggested sample size is 5 to 12 participants (Usability.gov, n.d.). This study was conducted at a 136-bed tertiary care referral Veterans Affairs Medical Center. Prior to data collection, the study was approved by the University Institutional Review Board, which serves as the Institutional Review Board for the Veterans Affairs Medical Center. Patient Participants. A convenience sample of 24 individuals were involved as patient participants. Letters of invitation were mailed to patients who had upcoming primary care clinic appointments. The letter described the study and noted that caregivers or relatives accompanying patients to the clinic could also participate. A few days after the letters were mailed, potential participants were contacted by telephone to determine whether they were interested in participating and to answer any questions about the study. For those who agreed to participate, a time and place to meet on their upcoming appointment day was set. Clinician Participants. A convenience sample of 9 clinician participants were also included. Three clinicians known to the investigators were approached to participate (1 physician, 1 RN, and 1 clinical pharmacist), and each of these clinicians then recommended two others from their respective profession. All participating clinicians were on staff at either or both the Veterans Affairs Medical Center and the University hospitals and clinics. An investigator-developed survey instrument was developed based on the literature (Rudd, 1979), manufacturer descriptions of device features, and the investigators’ previous experience with evaluating users’ interaction with technology (Buckwalter et al., 2004; Johnson-Mekota et al., 2001) and development of survey items (Wakefield, Lowery, Kobb, Clements, & Brady, 2002). The survey consisted of 17 items focused on cueing, storage and dispensing, machine characteristics, and medication-taking behaviors (Table 1). Each item was scored on a 5-point Likert-type scale of easy to difficult for cueing and strongly agree to strongly disagree for storage and dispensing, machine characteristics, and medication-taking behaviors. Participants completed a survey for each device they tested. Patient participants were provided with the retail price of each device and were asked two additional questions regarding their perceptions related to the cost of the devices. Because vision and hearing deficits, arthritis, and cognitive impairment are more common among older adults who would be likely users of these devices, clinician participants responded to four questions addressing these issues. For these questions (e.g., “What degree of impairment can a patient have and still successfully use this product?”), a 4-point scale of none to severe was used. Prior to enrolling participants, three investigators pilot tested the data collection protocol. On the day of the participant’s scheduled study appointment, an investigator met the participant and escorted him or her to a conference room where the testing was performed. The study was reviewed, the participant’s questions were answered, and informed consent was obtained. Participants completed a short demographic questionnaire, including whether they had previously used a medication device. Specific tasks during the data collection were then reviewed. Participants were encouraged to speak openly during the process. Medication dispensers: CompuMed Medication Reminder, Medication Dispenser and MedReady Automated Medication Dispenser. Portable combination alarms and organizers: e-pill® 7-day Medication Reminder and Organizer with 37 daily alarms [EZ37], e-pill EZ72 Medication Reminder and Organizer [EZ72] (no longer available from the manufacturer), e-pill MEDGlider Medication Manager System (weekly version), and e-pill CASIO Vibrating 5-Alarm Clock with Pill Case. Alarm only: e-pill Pager Vibrating 12-Alarm Medication Reminder. These devices were selected to represent a broad range of features and prices available on the market at the time of the study. Using a software randomization program, each participant was randomly assigned the order in which they would complete testing on the devices. Using the written manufacturer operating instructions, a sequence of steps for operating each device was developed. Participants were asked to read the instructions for a given device, complete five typical steps one might complete when using the device, and complete a short survey. The first step was to set the time of day to 8:00 a.m. according to the instructions given for each device. The second step was to set two alarms—a morning alarm for 8:30 a.m. and an evening alarm for 7:00 p.m. The third step was to load the medication device with simulated medications (i.e., various sizes, shapes, and colors of pieces of candy) using a simulated dosing schedule. The dosing schedule consisted of a two dosage per day regimen and four different kinds of medications. After the device was loaded, the investigator then reset the time on the device to display 8:29 a.m. so the alarm would sound in 1 minute. When the alarm sounded, the participant was asked to perform the fourth step, which was to temporarily silence the alarm. The final step was to turn off the alarm for an extended period of time. One device malfunctioned during the course of the study, so not all participants tested all devices. After all steps were performed for a given device, participants completed a survey rating the device (Table 1). Participants where then thanked for their time and given a small gift for their effort. Data were analyzed using descriptive statistics to express responses to each survey item. (Data for all individual items are not shown.) Using the 17 survey items, an overall mean score was calculated for each device, and then the devices were ranked using this score. We then calculated mean scores for each of four scales (see Table 1 for questions within scales): cueing, storage and dispensing, machine characteristics, and medication-taking behaviors. For one statement, “This machine would make it more likely that I would take my medications,” we conducted a one-way analysis of variance (ANOVA) for patient responses. Patient Participants. Of the 24 patient participants, 22 were patients and 2 were individuals who accompanied the patient to the clinic visit (1 wife, 1 grandson). Most were men (n = 22) and Caucasian (n = 22); 2 were Hispanic or Latino. The age breakdown was as follows: 4% (n = 1) were ages 20 to 29; 21% (n = 5) were ages 50 to 59; 29% (n = 7) were ages 60 to 69; and 46% (n = 11) were age 70 or older. The majority (88%, n = 21), were high school or college graduates. Slightly more than half (54%, n = 13) reported income less than $25,000 per year, and 11 (46%) reported income between $25,000 to $50,000 per year. Many (63%, n = 15) had someone who reminded them if they forgot to take their medication. Fourteen (58%) wore eyeglasses all of the time, but almost all (n = 21) wore eyeglasses at least some of the time. Four reported other visual impairments (i.e., blind in one eye, cataracts, nearsighted with astigmatism, some visual loss). Five patients wore hearing aids. Six reported previous experience with medication devices. Clinician Participants. Nine clinicians participated in the study, 3 physicians, 3 clinical pharmacists, and 3 RNs. One physician was a geriatrician, and 2 were general internists. Gender was fairly balanced (n = 4 women) with ages ranging from 30 to 59. Consistent with the local population, 89% (n = 8) were Caucasian. Years of professional experience ranged from 6 to 29 years, with a mean of 16.5 years (SD = 7.7 years). Approximately half of the clinician participants (n = 4) were required to wear eyeglasses all of the time, and 1 clinician reported limited vision in one eye. None wore hearing aids, but 1 clinician reported a 50% to 75% hearing loss in one ear. None of the clinician participants had personally used a medication device prior to this study. 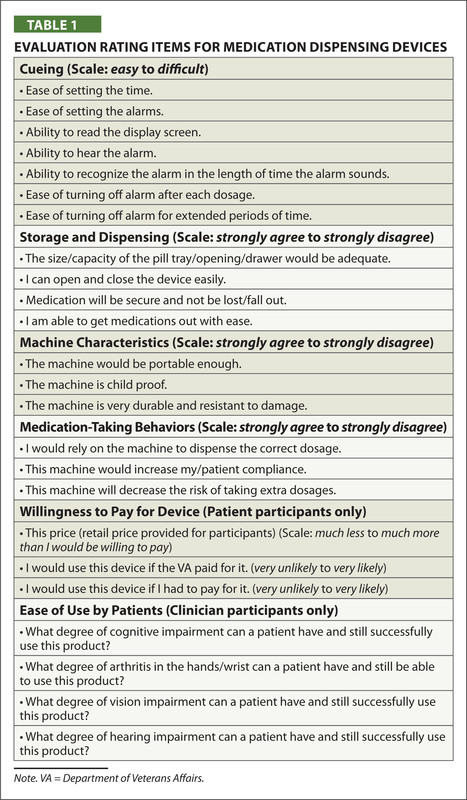 Tables 3 and 4 summarize the overall rankings of the devices and responses to the statements: “This machine would make it more likely that I would take my medications” and “This machine would increase patient compliance.” Using the overall score, the CompuMed device was the top ranked for both patients and clinicians. A broader range of scores was found for patients compared with clinicians. Regarding the likelihood that a device would improve medication adherence, again the CompuMed device ranked first for both groups, and again, the range of scores was broader for patients. Interestingly, clinicians ranked the e-pill Pager as second best overall; this might be related to clinicians’ familiarity with using pagers. Using the patient data only, we then conducted a one-way ANOVA for the statement: “This machine would make it more likely that I would take my medications.” There were no significant differences across the devices. We conducted a nonparametric test (Wilcoxon) and also eliminated the CASIO device, which had the most missing data (missing for 16 participants), and no significant differences on the perceived effect on adherence were found using any of these three approaches. Figures 1 and 2 summarize the responses to the four scales by device tested. As both Figures show, specific scale ratings varied across devices. For example, although the CompuMed device scored highest overall, its ratings on the Machine Characteristics scale indicated that patients perceived this device as less desirable related to portability, child proofing, and durability, compared with other devices. Figure 1. Patient Ratings of Device Characteristics.Casio = E-Pill® Casio Vibrating 5-Alarm Clock with Pill Case; CompuMed = CompuMed Medication Reminder, Medication Dispenser; EZ37 = E-Pill 7-Day Medication Reminder and Organizer with 37 Daily Alarms; EZ72 = E-Pill EZ72 Medication Reminder and Organizer; MEDGlider = E-Pill MEDGlider Medication Manager System (weekly Version); MedReady = MedReady Automated Medication Dispenser; Pager = E-Pill Pager Vibrating 12-Alarm Medication Reminder. Figure 2. Clinician Ratings of Device Characteristics.Casio = E-Pill® Casio Vibrating 5-Alarm Clock with Pill Case; CompuMed = CompuMed Medication Reminder, Medication Dispenser; EZ37 = E-Pill 7-Day Medication Reminder and Organizer with 37 Daily Alarms; EZ72 = E-Pill EZ72 Medication Reminder and Organizer; MEDGlider = E-Pill MEDGlider Medication Manager System (weekly Version); MedReady = MedReady Automated Medication Dispenser; Pager = E-Pill Pager Vibrating 12-Alarm Medication Reminder. Depending on the scale, ratings could vary greatly across the four scales for the same device. 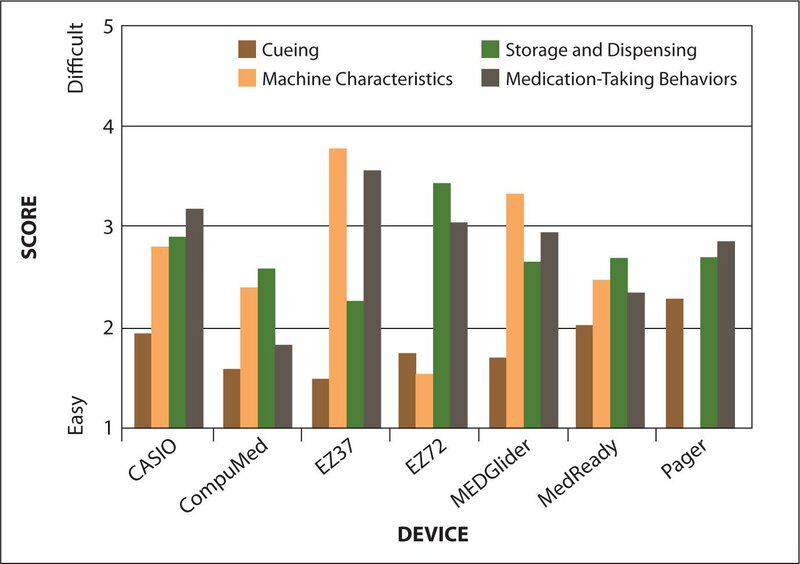 For example, clinicians rated the EZ72 as worse on Machine Characteristics and Medication-Taking Behaviors but better for Cueing and Storage and Dispensing. The e-pill Pager ranked second overall among clinicians but received the worst score for Cueing. 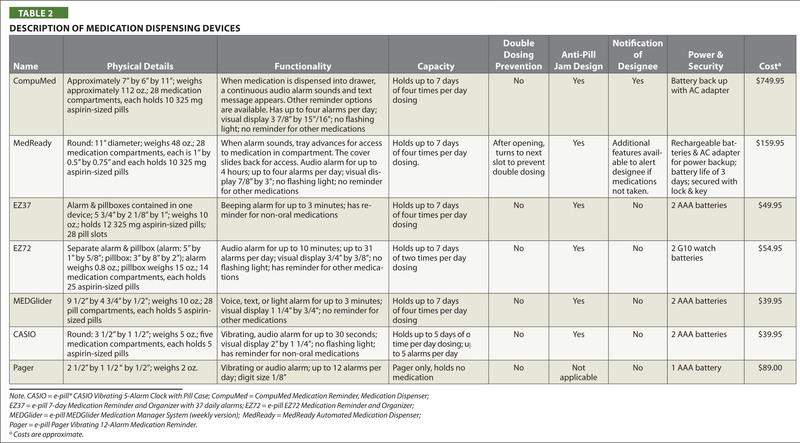 Figure 3 summarizes clinicians’ responses to the use of these devices by patients with cognitive, physical, and sensory limitations. Overall, the devices as a group scored the worst on use by patients with cognitive impairments and best for patients with hearing impairments. Figure 3. Clinician Ratings of Patient Usability: Degree of Impairment a Patient Can Have and Still Use the Product Successfully.Casio = E-Pill® Casio Vibrating 5-Alarm Clock with Pill Case; CompuMed = CompuMed Medication Reminder, Medication Dispenser; EZ37 = E-Pill 7-Day Medication Reminder and Organizer with 37 Daily Alarms; EZ72 = E-Pill EZ72 Medication Reminder and Organizer; MEDGlider = E-Pill MEDGlider Medication Manager System (weekly Version); MedReady = MedReady Automated Medication Dispenser; Pager = E-Pill Pager Vibrating 12-Alarm Medication Reminder. Patient participants considered these devices in terms of cost. Although CompuMed and MedReady devices scored highest overall, they were also the most expensive of those tested. 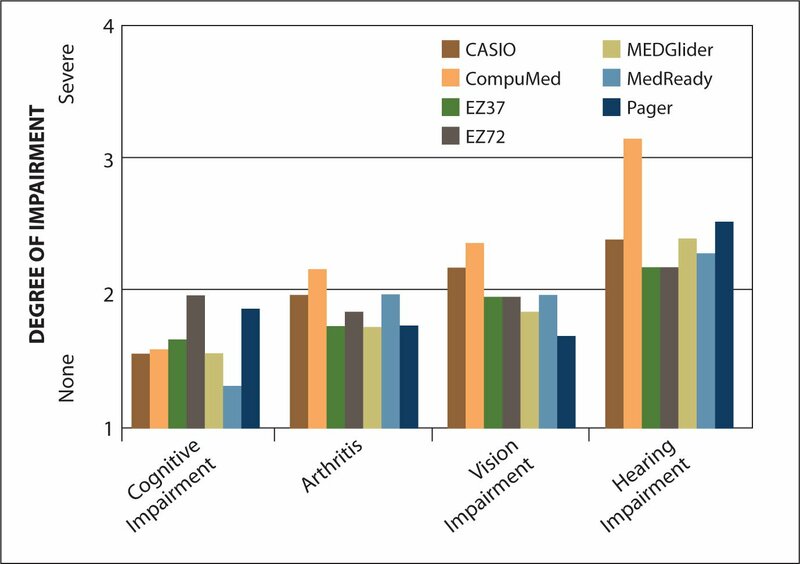 The least expensive device, the CASIO device, scored the worst overall compared with the others tested and scored second highest (after the CompuMed device) as costing much more than these patients were willing to pay (data not shown). Given the retail price of any of these devices, the price is much more than these patients are willing to pay. That is, the overall scores for all devices on the question, “I would use this device if I had to pay for it,” were in the very unlikely range. Not surprisingly, with the exception of the CASIO device, patients would be more likely to use the device if the Department of Veterans Affairs (VA) paid for it. However, even if the VA paid for the device, in general, these patients would not be likely to use most of these devices. This study addresses recently published research recommendations (Krupinski et al., 2006) calling for research on comparisons across platforms (e.g., comparison of multiple devices that perform a specific task) and usability in specific populations (e.g., patients, clinicians). 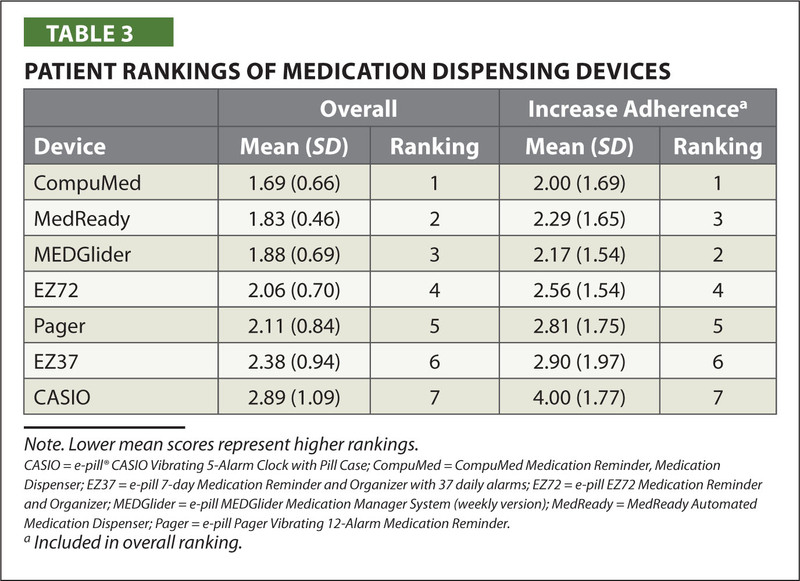 Overall, study participants rated the medication dispensers highest in overall ranking (CompuMed and MedReady devices). These dispensers were also the most expensive devices tested. No significant differences were found across the devices in the perceived likelihood that using the device would improve medication-taking behavior. However, even if the VA paid for them, the patient participants would be unlikely to use them. Clinician perceptions indicated that opportunities for improvement in these devices remain, particularly when older patients have cognitive or physical impairments. Limitations of this study include using a sample of interested volunteers. These volunteers might be more interested in technology and thus may have been more positive or knowledgeable about such devices. We wrote user instructions for each device because we found the manufacturer instructions difficult and inconsistent across devices, and this may have affected users’ perceptions of the devices. Participants did not receive extended training in using the devices, other than the written instructions provided. It is likely that with repetition, the devices would become more familiar, and participants may have rated them differently. Participants used a standardized dosing regimen, rather than their own scheduled medications, thus patient perceptions of the usability of the device may have been different if they had used a familiar dosing schedule. Because the patients were eligible for VA health care, we did not ask the “willingness to pay” question relative to coverage by private health insurance, so results on costs cannot be generalized to individuals who are not covered by VA care. These findings are applicable to the devices tested and cannot be generalized to all medication devices. Teaching patients about medication management and adherence is an important and frequent nursing intervention. In patients with chronic illness who believe following a healthy lifestyle is too much trouble, only approximately 7% have a routine for taking their medications. Of those who do not, more than half expressed an interest in using a reminder device to help them take their medications (Hopfield, Linden, & Tevelow, 2006). Therefore, nurses will be consulted by patients who are considering purchasing these devices. How many pills does the patient take per day? How many pills does the patient take with each dosage? What size are the pills? Are there any potential adverse outcomes if the medication dosage is doubled? Is the patient at home or away from home when he or she takes most of the pills? Does the patient take any liquid medications? Does the patient have any trouble with vision? With hearing? With opening containers? Does the patient carry a purse or pack when away from home? Is the patient able to use the device’s battery recharging system? Is cost a concern for the patient? Will the patient’s insurance cover the cost of the device? Does someone need to be notified when the patient misses a medication? Clinicians who are considering prescribing medication adherence devices for their patients need to pay close attention to patient training issues and ensure the recommended device matches the patient’s capability. In a recent study, older adults were trained to use a personal digital assistant (PDA) to manage medications (Sterns, 2005). After 9 hours of training, only 25% of participants were able to demonstrate complete mastery of the PDA, although all participants were able to use the application designed for medication reminders. Clearly, the patient’s cognitive status and availability of an informal caregiver will be important in deciding whether a given device is appropriate for the patient. After it has been determined that the patient is an appropriate candidate for a given device, a structured training plan should be implemented. Written instructions that come with these devices are often confusing and difficult to follow. Therefore, we recommend developing easy-to-read checklists for teaching patients about the devices. Ongoing reassessment of the patient’s use of the device to improve medication taking is critical to success. Nurses should ask the patient to demonstrate use of the device at each visit until it is clear the patient has mastered the technology. Providing supplemental instruction on use of the device requires that nurses be educated and trained on current medication device technology. Training is especially crucial for individuals who are not familiar with using newer technologies. How many days in the past month did you miss taking your pills? How many days in the past month did you have difficulty taking the correct number of pills each day? How many days in the past month did you have difficulty taking all of your pills on time? Development of medication adherence interventions must be multifaceted and should include behavioral, cognitive, and affective approaches (Bosworth, 2006; Haynes, McDonald, Garg, & Montague, 2002; Roter et al., 1998). Clearly, more work is needed in the design and deployment of these kinds of devices if they are to be part of a successful medication adherence plan. Clinicians may be less likely to prescribe devices if they perceive them to be difficult to use. These preliminary results can be used to inform the design (and redesign) of medication devices. Further research is needed in larger samples and a variety of patient populations who might find these devices useful. Research is also needed to evaluate whether these kinds of devices actually improve patient adherence to medication regimens. Armstrong, SD, Brewer, WC & Steinberg, RK2002. Usability testing. In Charlton, SG & O’Brien, TG (Eds. ), Handbook of human factors testing and evaluation (pp. 403–432). Mahwah, NJ: Erlbaum. Bosworth, H. 2006. Medication treatment adherence. In Bosworth, HB, Oddone, EZ & Weinberger, M (Eds. ), Patient treatment adherence: Concepts, interventions, and measurement (pp. 147–194). Mahwah, NJ: Erlbaum. Buckwalter, KC, Wakefield, BJ, Hanna, B & Lehmann, J2004. New technology for medication adherence. Journal of Gerontological Nursing, 307, 5–8. Crome, P, Akehurst, M & Keet, J1980. Drug compliance in elderly hospital in-patients: Trial of the Dosett box. The Practitioner, 224, 782–785. Haynes, RB, McDonald, H, Garg, AX & Montague, P. 2002. Interventions for helping patients to follow prescriptions for medications (Article No. CD000011). Cochrane Database of Systematic Reviews, Issue 2. Hopfield, J, Linden, R & Tevelow, B. 2006. Getting patients to take their medicine. The McKinsey Quarterly, 4, 1–2, 14–15. Johnson-Mekota, JL, Maas, M, Buresh, KA, Gardner, SE, Frantz, RA & Pringle Specht, JK et al. 2001. A nursing application of telecommunications: Measurement of satisfaction for patients and providers. Journal of Gerontological Nursing, 271, 28–33. Park, DC, Morrell, RW, Frieske, D, Blackburn, AB & Birchmore, D. 1991. Cognitive factors and the use of over-the-counter medication organizers by arthritis patients. Human Factors, 331, 57–67. Rudd, P1979. Medication packaging: Simple solutions to nonadherence problems?Clinical Pharmacology & Therapeutics, 25, 257–265. Russell, CL, Conn, VS & Jantarakupt, P2006. 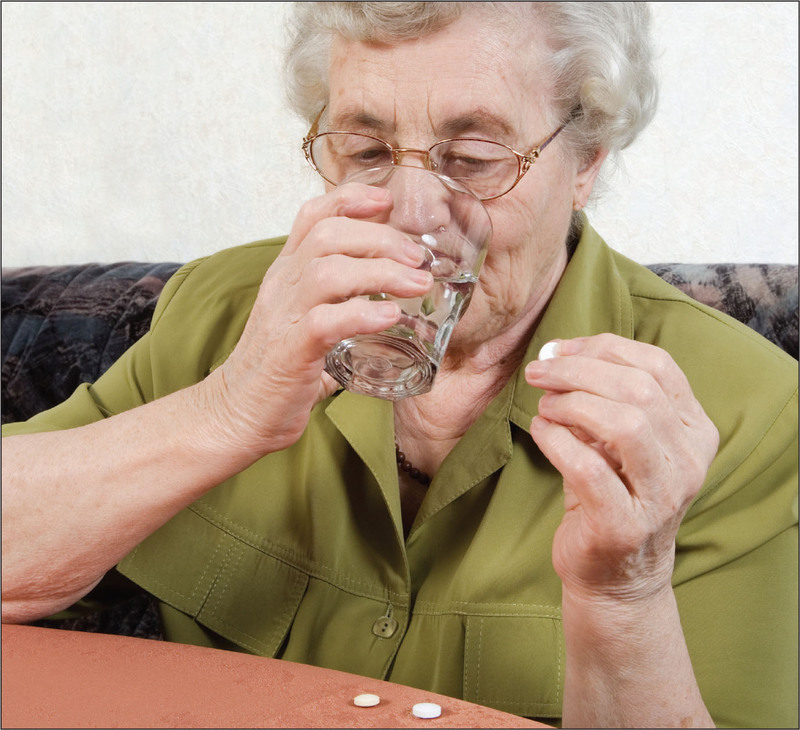 Older adult medication compliance: Integrated review of randomized controlled trials. American Journal of Health Behavior, 30, 636–650. Salzman, C1995. Medication compliance in the elderly. Journal of Clinical Psychiatry, 56Suppl. 1, 18–22. Sterns, AA2005. Curriculum design and program to train older adults to use personal digital assistants. The Gerontologist, 45, 828–834. Wakefield, B, Lowery, J, Kobb, R, Clements, E & Brady, M2002. Development of an item bank for telehealth evaluation [Abstract]. Telemedicine Journal and e-Health, 8, 268. Winland-Brown, JE & Valiante, J2000. Effectiveness of different medication management approaches on elders’ medication adherence. Outcomes Management for Nursing Practice, 4, 172–176. •Ease of setting the time. •Ease of setting the alarms. •Ability to read the display screen. •Ability to hear the alarm. •Ability to recognize the alarm in the length of time the alarm sounds. •Ease of turning off alarm after each dosage. •Ease of turning off alarm for extended periods of time. •The size/capacity of the pill tray/opening/drawer would be adequate. •I can open and close the device easily. •Medication will be secure and not be lost/fall out. •I am able to get medications out with ease. •The machine would be portable enough. •The machine is child proof. •The machine is very durable and resistant to damage. •I would rely on the machine to dispense the correct dosage. •This machine would increase my/patient compliance. •This machine will decrease the risk of taking extra dosages. •What degree of arthritis in the hands/wrist can a patient have and still be able to use this product? •What degree of vision impairment can a patient have and still successfully use this product? •What degree of hearing impairment can a patient have and still successfully use this product?